In the past decade, China was able to carry out economic reform without political reform, while the Soviet Union attempted the opposite strategy. How did China succeed at economic market reform without changing communist rule? Susan Shirk shows that Chinese communist political institutions are more flexible and less centralized than their Soviet counterparts were. Shirk pioneers a rational choice institutional approach to analyze policy-making in a non-democratic authoritarian country and to explain the history of Chinese market reforms from 1979 to the present. Drawing on extensive interviews with high-level Chinese officials, she pieces together detailed histories of economic reform policy decisions and shows how the political logic of Chinese communist institutions shaped those decisions. 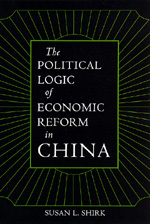 Combining theoretical ambition with the flavor of on-the-ground policy-making in Beijing, this book is a major contribution to the study of reform in China and other communist countries. Susan L. Shirk is Professor of Political Science at the University of California, San Diego, and the author of Competitive Comrades: Career Incentives and Student Strategies in China (California, 1982).